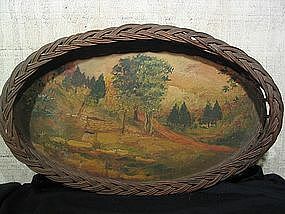 Vintage tray or basket with woven rim and wooden bottom. It is 16 1/2" in length, 10" in width and the woven portion extends to 1 1/2" in height. The weave is without damage except for 2 cracks. The painting does not appear to have actual damage, but there are a couple of rough areas where the wood is bumpy, but would not be considered damage. The weave needs to be cleaned. I will be glad to provide additional photos. I need your zip code to calculate the postage.